What is Highpower you ask? High Power competition is shot with center fire rifles divided into two categories. 2 Match rifle, which consist of bolt guns or modified AR-15's with "iron" (non telescopic) match sights, like these examples below. The courses of fire consist of four separate matches shot in three different shooting positions at three different distances. The 80 round "National Match" course. 20 shots slow fire from "standing" at 200 yards. 20 shots rapid fire from "sitting" at 200 yards. 20 shots rapid fire from "prone" at 300 yards. 20 Shots slow fire from "prone" at 600 yards. The 50 round "National Match" course. 10 shots slow fire from "standing" at 200 yards. 10 shots rapid fire from "sitting" at 200 yards. 10 shots rapid fire from "prone" at 300 yards. *** Note: At Central Jersey we fire the 80 round course for all 4th Sunday NRA matches, while the CMP John C. Garand matches fire the 50 round course. All positions can be shot at reduced range with the appropriate reduced targets, here at Central Jersey we fire at 200 and 300 yards only. 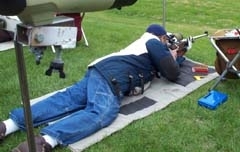 Each shooter has the option of firing the entire match at 200 yards or of move back to 300 yards for the prone stages. You start in Standing position, at the 200 yard line. Standing is fired "slow fire" loading one shot at a time. You are allowed one minute per shot and are also allowed two additional minutes for two "sighting" shots. The 80 round course is 22 shots, two sighting shots and 20 shots for record in 22 minutes. The 50 round course is 12 shots, two sighting shots and 10 shots for record in 12 minutes. 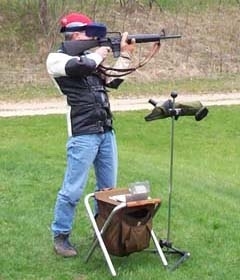 Next is Sitting position, also shot at the 200 yard line. Sitting position is shot "rapid fire", 10 shots in sixty seconds with a mandatory reload. With ammo/magazines on the ground (mat) or shooting stool not to be touched, with bolts remaining open & rifles out of the shoulder, awaiting the command to commence fire. In your firing position with targets up, at the command to commence fire, load with two or five rounds for service rifles or five rounds for match rifles. Fire your two or five rounds, reload (with the remaining eight or five rounds) & complete firing before the cease fire command within the allowed sixty seconds. For the 80 round course you shoot two strings of 10 shots. For the 50 round course you shoot one string of 10 shots. The third match is shot from the "Prone" position at 200 or 300 yards. Just like "Sitting" it is shot "rapid fire" only now you have seventy seconds for ten rounds. 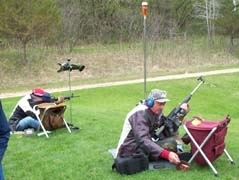 As in Sitting you are allowed two minutes for two sighting shots. Note: All positions can be shot at reduced range with the appropriate reduced targets, here at Central Jersey we fire at 200 and 300 yards only. Each shooter has the option of firing the entire match at 200 yards or of move back to 300 yards for the prone stages. The final match is shot from the "prone" position, only now in "slow fire" from the 200 or 300 yard line. You are allowed twenty two minutes for two "sighting" shots and twenty shots for record.